At the time of the Armory Show, Americans were engaged in a new consumer culture, one that constantly reached out to them and attempted to gain their loyalty. Advertising was visible all over the city, a phenomenon that only increased through the century, and continues today. New Yorkers in 1913 were confronted with advertisements constantly. Ads proliferated in magazines and newspapers, and in the public sphere, on billboards, posters, and neon signage. Whether at home or on the street, New Yorkers were sure to see some form of marketing in their daily lives. In the 1890s, advertising had become more professionalized, and companies began relying on branding and national campaigns, and increased their budgets for advertising. Photographs of New York street scenes can give us a glimpse of the types of large-scale advertisements New Yorkers encountered in their city. 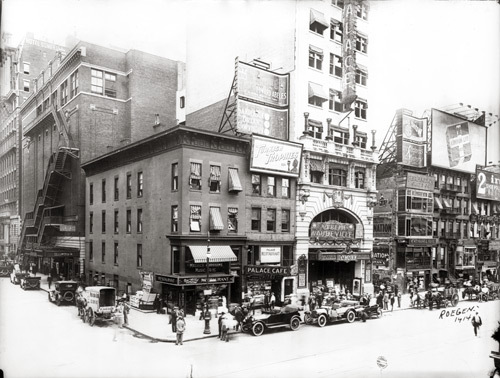 William Roege’s 1914 photo of Times Square at 47th Street shows a great number of billboards. The buildings surrounding the Palace Theater are covered in advertisements. There are ads both for consumer products, like cigarettes, and the shows and movies which audiences could see in the theaters of Times Square, including 1915’s Birth of a Nation. Smaller advertisements are visible on the street level in store windows, likely noting products available inside. The ads have few visual components, and instead emphasize the brand name of the product being marketed, typical of billboards of this period. By the first decade of the twentieth century, magazines contained substantially more advertising than they had just a few years before, and readers were used to seeing ads intermixed with their news. In magazines, advertisements of the period relied more on the visual, though they often included plenty of text. “Weavers of Speech,” a 1915 Bell telephone ad, includes a reproduction of a painting that depicts the modern world being managed under the careful orchestration of a beautiful operator. Her wires connect the city to the suburbs to industrial companies, suggesting the rapidly interconnected modern world that was emerging in the early twentieth century.